A valuable reference tool for professionals involved in the industry, Drug Metabolism in Pharmaceuticals covers new tools such as LC-MS and LC-MS-NMR along with experimental aspects of drug metabolism. This work fills a gap in the literature by covering the concepts and applications of pharmaceutical research, development, and assessment from the point of view of drug metabolism. 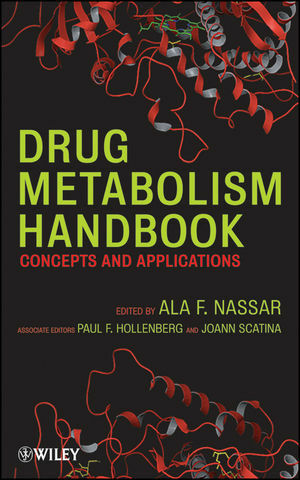 By providing both a solid conceptual understanding of the drug metabolism system, and a well illustrated, detailed demonstration and explanation of cutting edge tools and techniques, this book serves as a valuable reference tool for bench scientists, medical students, and students of general health sciences. Ala F. Nassar, PhD, provides technical and operational leadership in characterizing in vitro and in vivo metabolites. His research focuses on understanding how structure modification can improve the ADME profile for new chemical entities as they advance towards clinical candidacy. Recently, he identified and patented pharmacologically active metabolites of Nexavar®. Dr. Nassar serves on the Editorial Board of Drug Metabolism Letters and The Open Drug Metabolism Journal and is also a reviewer for several other journals. Paul F. Hollenberg, PhD, is Maurice H. Seevers Collegiate Professor and Chair of Pharmacologyat The University of Michigan. His current research focuses on the relationship between thestructures of the active sites of cytochrome P450s and their catalytic function. Dr. Hollenbergwas cofounder and Associate Editor of Chemical Research in Toxicology and has served onnumerous editorial boards and review panels. Joann Scatina, PhD, has over twenty-four years of drug metabolism experience, and is currentlyVice President of the Drug Metabolism Division, Drug Safety and Metabolism, for WyethResearch. Dr. Scatina's research interests include identification of metabolites, metabolicpathways and enzymes responsible, in vitro-in vivo extrapolation, and prediction of druginteractions. She is a member of the American Society for Pharmacology and ExperimentalTherapeutics and the International Society for the Study of Xenobiotics (ISSX) and is currentlyserving on the Editorial Board of Drug Metabolism Reviews. 1. Historical Perspective (Roberta S. King). 2. Factors Affecting Metabolism (Roberta S. King). 3. Biotransformation sin Drug Metabolism (Roberta S. King). 4.In Vivo Metabolite Kinetics (Zheng Yang). 5. Pharmacogenetics and Pharmacogenomics (Lilian G. Yengi). 6. Introduction to drug transporters (Louis Leung and Aram Oganesian). Part II: Technologies for In Vitro and In Vivo Studies. 7. Automated Drug Screening for ADMET Properties (Melvin Reichman and Helen Gill). 8. Mass Spectrometry (Thomas R. Sharp). 9. Approaches to Performing Metabolite Elucidation: One Key to Success in Drug Discovery and Development (Ala F. Nassar). 10. Structural Modifications of Drug Candidates: How Useful Are They in Improving Metabolic Stability of New Drugs? Part I: Enhancing Metabolic Stability (Ala F. Nassar). 11. Structural Modifications of Drug Candidates: How Useful Are They in Improving PK Parameters of New Drugs? Part II: Drug Design Strategies (Ala F. Nassar). 12. Minimizing the Potential for Drug bioactivation of drug Candidates to Success in Clinical Development (Ala F. Nassar). 13. Screening for reactive Metabolites Using Genotoxicity Arrays and Enzyme/DNA Biocolloids (James F. Rusling, Eli G. Hvastkovs, and John B. Schenkman). 14. Enzyme Inhibition (Paul F. Hellenberg). 15. Evaluating and Predicting Human Cytochrome P450 Enzyme Induction (Michael Sinz, Sean Kim, Stephen Ferguson, and Edward LeCluyse). 16. An Introduction to Metabolic Reaction Phenotyping (Carl D. Davis and A. David Rodrigues). 17. Nuclear receptor-Mediated Gene Regulation in Drug Metabolism (Hongbing Wang and Wen Xie). 18. Characterization of Cytochrome P450 Mechanism-Based Inhibition (Dan Rock and Larry C. Wienkers). 20. Pharmaceutical Excipients in drug-Drug Interaction (Chuan Chen and Abu J. M. Sadeque). 21. The Role of Drug Metabolism in Toxicity (Carl D. Davis and Umesh M. Hanumegowda). 22. Allergic reactions to Drugs (Mark P. Grillo). 23. Chemical Mechanism in toxicology (Mark P. Grillo). 24. Mechanisms of Reproductive Toxicity (Aileen F. Keating and Patricia B. Hoyer). 25. An Introduction to Toxicogenomics (Aaron L. Vollrath and Christopher A. Bradfield). 26. Role of Bioactivation Reactions in Chemically Induced Nephrotoxicity (Lawrence H. Lash). 27. Drug Metabolism in regulatory Guidances, clinical trials, and Product Labeling (Mark N. Milton).